Saddle up and ride this seasons latest trend for equine motifs and horse patterns with the new Gymkhana wallpaper design from contemporary children's brand, Hibou Home. 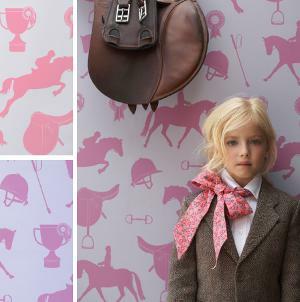 With its sophisticated equestrian theme, Hibou Home’s playful Gymkhana wallpaper is every horse and pony lovers dream. The print features stylish silhouettes of jumping horses and riders, rosettes and trophies as well as saddles, riding crops and bits in muted block colours. Packed with personality to give any room a hint of individuality from girl’s bedrooms to boot rooms, its horsey design imparts a softer feel to this wild and wonderful style. Offering a sophisticated high quality collection, each wallpaper roll is meticulously designed and made in England with a wonderful depth and purity of colour finished in a chalky matt surface that’s utterly striking and unique. Hibou Home’s designer children’s wallpaper collection also includes: ‘Cactus Cowboy’, ‘Enchanted Wood’ and ‘Pirate Seas’ design styles. Available in two fabulous colourways: Fuchsia on soft Lilac and Coral Pink on Sand.